As the title indicates, every June we are reminded of the famed “June hogs” – giant chinook salmon that once migrated back through the Columbia Basin at about this time of the year. We will likely never see those runs again, but there’s still plenty of recovery to be had in one of our planet’s best salmon watersheds. On June 3, Rep. Jim McDermott (D-WA) and Rep. Tom Petri (R-WI), joined by 10 additional co-sponsors from across the nation, introduced the Salmon Solutions and Planning Act (H.R. 2111) in the House of Representatives. If passed, H.R. 2111 would provide Congress and federal agencies with up-to-date, thorough information about how best to protect and restore wild salmon and steelhead in the Columbia and Snake River Basin while also supporting local communities and saving taxpayer dollars. TAKE ACTION: Please send a message to your representative. Background on H.R. 2111 here. What is the Salmon Solutions and Planning Act (H.R. 2111)? What exactly does H.R. 2111 do? Last year, we faced one of the largest environmental disasters in our nation’s history: the Deepwater Horizon oil spill. In many ways, this tragedy helped renew a conversation about our energy future. While oil was spewing into the Gulf of Mexico, the Pacific Northwest was facing an incredibly stormy spring; lots of wind and rain led to a surplus of energy from both hydroelectric dams and wind turbines. The same situation is playing out this year as well, to an even greater extent. The result is a protocol where, in times of high wind and high water, BPA shuts off wind turbines as a way to reduce surplus power on the region’s grid. By putting wind power on the chopping block, BPA is shielding dam energy at the expense of clean energy jobs. BPA has now implemented this “over-generation” strategy and has begun shutting down wind power – a move that harms Northwest renewable energy development and the good jobs that go with it. 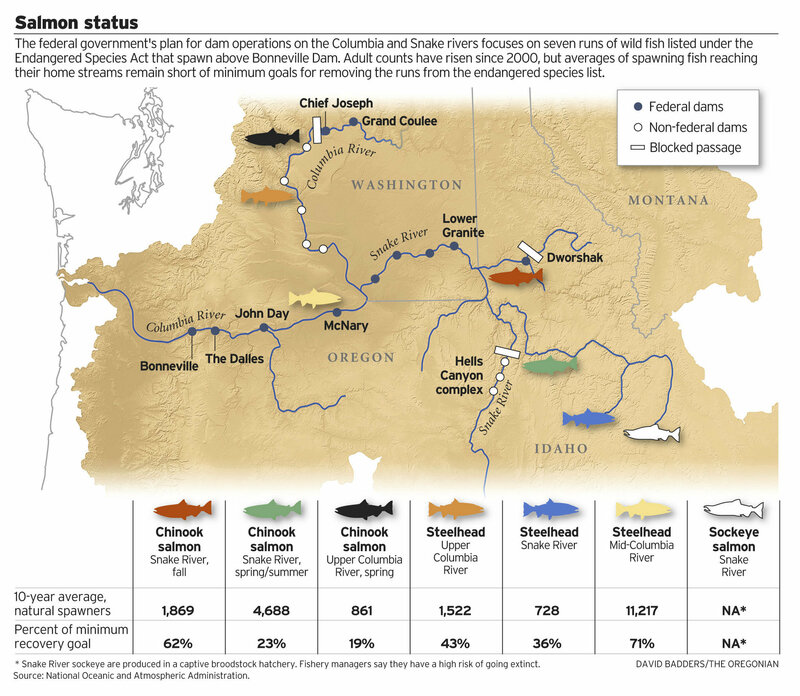 Judge Redden is expected to decide soon if the Obama administration’s plan passes legal muster — a decision that will determine the future of imperiled salmon and steelhead in the nation’s signature salmon watershed: the Columbia-Snake River Basin. The decision also has significant implications for the integrity of the Endangered Species Act. As the introduction of the Salmon Solutions and Planning Act (H.R. 2111) indicates, members of Congress are ready to move forward. The studies called for in H.R. 2111 can provide Congress, the Obama administration, federal agencies, and stakeholders in the Northwest with the up-to-date information needed for charting the best course to recover wild salmon and steelhead, invest in local communities, and save taxpayer and energy ratepayer dollars. Again, please urge your representative to co-sponsor H.R. 2111 here. This month, our partners at Idaho Rivers United (IRU) have launched an amazing new video series: “Salmon Stories.” In this series, 11 Idahoans discuss why salmon are important to their businesses, to Idaho’s ecology, and to the region’s cultural heritage. Check it out the videos here on IRU’s website – just click on the featured cities to view. From Lapwai to Boise and from Salmon to Riggins, the residents of Idaho want more wild salmon in the Salmon River and more red fish in Redfish Lake. “In this long-running regional discussion about recovering salmon and steelhead, there’s a tendency to focus on politics, legal benchmarks, and spreadsheets full of numbers. In some ways, that’s unfortunate,” said IRU Assistant Policy Director Greg Stahl. More from Idaho Rivers United.